ARLEE — With a current season record of 12-1, the Arlee Warriors are a top team in their division. Averaging nine steals and 12 assists, Sophomore Philip Malatare has played an important role in the success of this year’s basketball team, according to Head Coach Zanen Pitts. 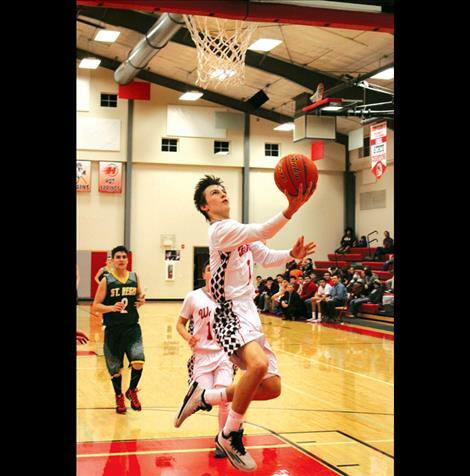 On Thursday, Jan. 28, Malatare contributed 12 points to the Warriors 83-23 win over St. Regis. Being one of the younger players on the team and in control of running the Warriors offensive game, Malatare is aware that his job for the team is vital. Pitts noted that the team boasts a lot of guards that can handle the ball. “We are also more committed than previous years,” Malatare added. Having only lost one game this season, Pitts is happy with the wins. However Pitts knows there are still things the Warriors need to improve before the divisional tournament. With only four games left until tournament time, Malatare would also like the Warriors’ offense to peak at the right moment. The Arlee Warriors head to Darby on Thursday, Feb. 4 for a 5:30 p.m. tip-off. Following Thursday’s game, Arlee hosts Noxon on Saturday, Feb. 6 for a 6 p.m. game. Arlee – Points: Tyler Tanner 16, Justis Haynes 13, Philip Malatare 12, Patrick Bigsam 11, Colt Brazill 8, Isaac Desjarlais 6, Rory Bird 6, Ivory Brien 4, Brad Brazill 4, and Alex Moran 3.